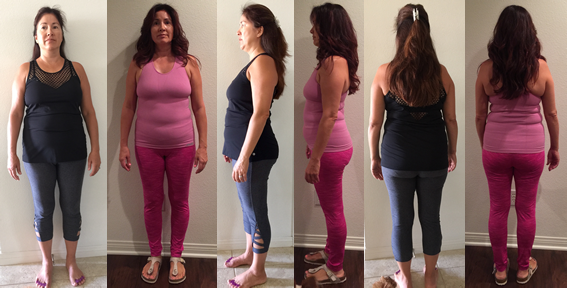 Brenda’s Journey to Goal – 3 Months 40 lbs & Goal! 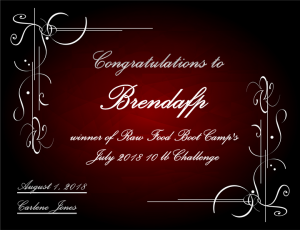 Brenda came to camp determined to get to goal fast and she did it. 40 lbs & goal in 3 months. Wow! She is now in maintenance and working toward her life diet following Dr. Furhman’s plan. She lost her weight with us doing our Rawk Starz diet and 2 hours of swimming and elliptical each day. She wasn’t always perfect, but she mostly was. I am sure I can speak for everyone at camp, Brenda has been a true asset to all our members. She is a big participator and encourager to all our other ladies. It’s been pure joy working with her. Can you believe she is in her 50’s!! I was shocked when I read her In Her Own Words. I teased her when I made her these B&As that the before woman looked like the mother of the after woman. Now I know just how true that statement was! Wow! She doesn’t look over 30 in those after shots. 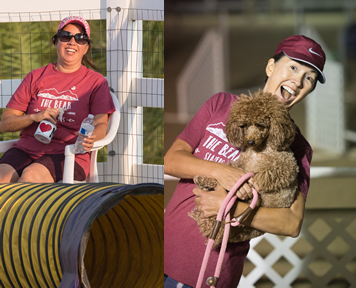 Brenda is into Agility dog training and offered to share these before and afters with you. Can you tell which is the after! That after shot is one of my favorite goal shots ever! I’m 52 years young, married with a 25-year-old son who lives at home. At the beginning of this year, I got toe surgery and I’ve been recovering ever since. The first couple of months were very hard for me since I had to limit my mobility. Not being able to take care of myself and the lack of mobility really added on the pounds. I also was just starting to enjoy my new-found hobby of dog agility so my dogs and I had a very long break from that during my recovery. I wanted to be able to run with my dogs because I wanted to be better at dog agility and it’s hard being fat and overweight with a swollen foot. Besides doing this for myself, I wanted to lose this fat for my dogs, too. I finally realized that I wasn’t going to lose the fat without doing something I believed in(RFBC). I was just sick and tired of gaining and adding to my fat suit! Ugh, I just had it and so I really wanted to get down to business with losing as quickly as possible. Before joining RFBC, I was looking into other diets and ways of eating to see what really resonated with me. It all comes back to eating healthy for life and not having this be a temporary thing. I realized that I didn’t have a lifelong eating plan. The SAD definitely was not working for me! I was feeling fat and old with all of the extra weight. I knew that I needed to change what I eat for life and not temporarily. I don’t feel that I have a food addiction but I feel I needed help to eating a plant-based diet for life. I think losing the weight with RFBC and having to eat fruit and vegetables to lose the weight was exactly what I needed. It feels right losing weight like this because there aren’t any pills, supplements or crazy workout plans. Mentally, I feel so good about myself. I loved losing the weight quickly and healthfully. I’ve become my old bubbly, social self again without any fear of being seen by friends and family. Physically, my swollen foot has shrunk considerably, especially with the swimming. I can easily run around the dog agility arena without pain nor sluggishness. I’m so much lighter on my feet with a spring in my step. I began RFBC with a lot of digestive rumblings but now, my digestion is so much more balanced and quiet. I started off as a size 12 swimsuit and now I’m wearing a size 6 swimsuit! No one seemed to say or notice my weight loss until I reached around 25lbs gone. I think people didn’t want to say anything because they were so used to me being heavy. Once the word got out, I felt awesome saying I had lost 22.5, 25, 27, 30, etc pounds. This really motivated me to get to my weight loss goal faster than later. It was also fun when some of my friends I don’t see on a weekly basis are so surprised to see the real healthier version of me. For me, starting and getting near goal was the hardest part of this journey. But I had reached that point where I couldn’t stand being fat anymore so I was more than willing to get losing the weight over with sooner than later. It definitely wasn’t easy but you have to be willing to work hard for what you want. I also recommend asking Carlene for help any time that you need it. Don’t wait and try to figure this out on your own. I already tried that before RFBC and it didn’t work. Carlene recommends walking 2 hours every day to get faster results but I couldn’t do it with my foot. I had to replace the walking with swimming which I only did backstroke and the elliptical machine. I only added inclined treadmill walking during the last 2 weeks to goal. I eventually could get in 2 hours of exercise a day but I had to work up to it. 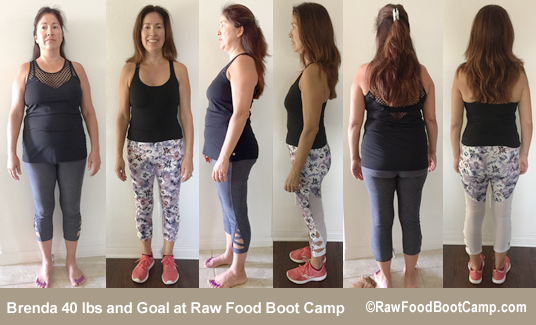 I chose the Rawk Starz eating plan because it will get you to goal fastest. I wasn’t perfect. But I learned that I had to stay on plan to get the faster results that I wanted. Carlene doesn’t let you get away with anything. The accountability and my willingness to do it really helped me to stay focused. One more thing, you need to have a really good reason to wanting to lose your fat suit. This helps to churn your desire to get the fat off sooner. It keeps you motivated. 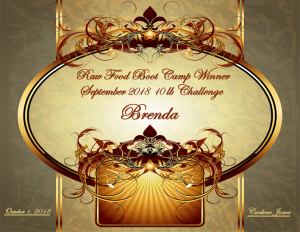 Brenda is a prime example of how our diet can take you all the way to goal without slowing down. 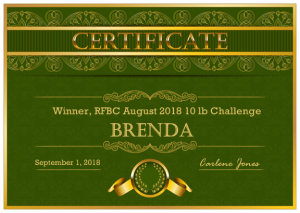 She started on July 13th almost halfway through the month and she still won our July 10 lb challenge with 10.9 lbs gone. In August she lost 17 lbs and won again. And then in September, she dropped 11.6 lbs for a total of 39.5 lbs in a little over 2.5 months. She took 3 more days to hit her 40 lbs gone and goal.